Tennessee American Staffordshire Terrier Rescue View other American Staffordshire Terriers for adoption. BECKA spent most of her first years of life either pregnant or nursing. The people in the town where she was found said she had litter after litter of pups. She would hang out at a school where she was fed by the school nurse and would play with the children. When she had her last litter, she ended up on the property of a man who said he was going to shoot her and her 6 nursing pups which is when the rescue was finally contacted and able to intervene. Becka's pups were weaned and have since been adopted. 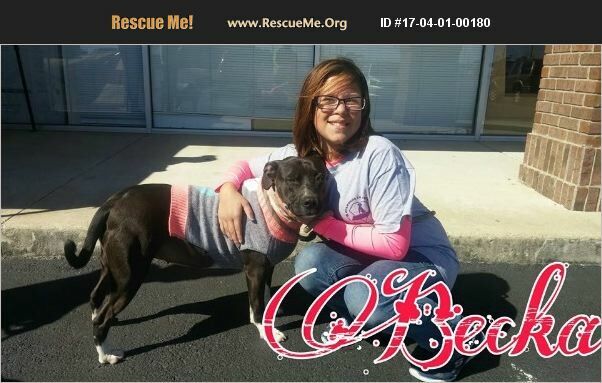 Now it is Becka's turn to find a good forever home. She is a black and white AST mix who is 3 to 4 years old and weighs 62 pounds. She has been vaccinated, spayed and microchipped. She tested positive for heartworm when first rescued but completed treatment to rid her of heartworms, and she is now testing heartworm negative. She gets along well with the other dogs at her foster home, but she is not good with cats, so a cat-free home is recommended. She has a sweet personality. She likes to talk and is friendly with both adults and children. If you live in another state, don't let that stand in your way. We will work to transport Becka if it means she will have a good forever home. If you are another rescue group, we will waive the adoption fee but you can make a donation toward vetting at your discretion. The adoption fee will help our 501(c)3 non-profit rescue to cover part of the cost of the veterinary care she has received.